Our dive shop features the only temperature controlled indoor dive facility in Oklahoma. Learn or practice scuba diving skills, take scuba classes and more in our temperature controlled indoor dive pool. It is 10' deep on the deep end and 3" on the shallow side. It's a convenient way to see if scuba diving is something you might enjoy. Bubblemaker is as fun as it sounds – a chance for kids to blow bubbles by scuba diving. Children who are at least 8 years old can use scuba gear to breathe underwater and swim around in shallow water. 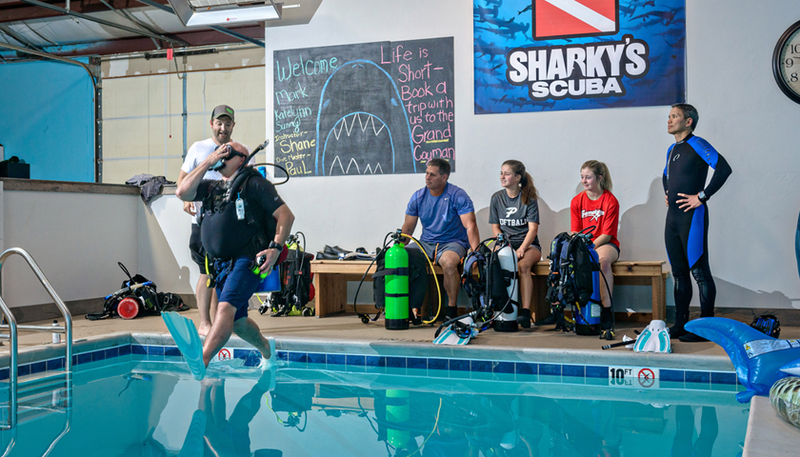 Have a party or celebrate a birthday by throwing a memorable, exciting Bubblemaker event with friends and family at Sharky's Scuba. A child must be 8 years old or older. Kids must be comfortable in the water, but no prior experience is necessary. Parental approval is required. Click here for details.